In FY17, 73,000 full- and part-time associates volunteered more than 1.2 million hours for various non-profits in their local communities. Associates may apply for a Volunteerism Always Pays (VAP) grant on behalf of their volunteer hours at eligible organizations. Once associates as individuals or as a group reach a threshold of 25 hours volunteered, individuals may apply for a $250 grant and groups may apply for grants up to $5,000 to the charity, generating $12 million in “dollar-for-doer” grants in FY17. Maxine Green, a Community Life Champion at our Morley store, was awarded the Leading Light Award by Prime Minister David Cameron for her ongoing community and charity work. In 2014, more than 400 associates working at our corporate office in Argentina invested more than 2,500 volunteer hours in local community projects and initiatives. When it comes to involvement in his community, Sreekumar Gopinathan has always been at or near the front of the line − regardless of where his career has taken him. But when he moved from Atlanta to northwest Arkansas to become a senior engineer in Walmart’s Information Systems Division, he was delighted to discover he had the support of an entire organization behind him. 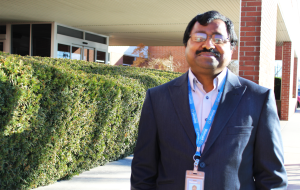 Sreekumar’s community involvement since joining the Walmart family has been nothing short of inspiring. He has been involved in more than 115 events in Arkansas and Oklahoma, averaging 40 volunteer projects and 230 volunteer hours per year. The Volunteerism Always Pays program matched Sreekumar’s contribution of time with charitable donations – $250 for the first 25 hours he volunteered and additional contributions for time volunteered beyond that − all directed to the nonprofits where he volunteered. Examples include transporting snacks from a local nonprofit to four elementary schools, computer and networking installations for the Dress for Success organization, lawn maintenance and house cleaning for several elderly residents, and more.